This review is part of a new once-in-a-while series, Remaking the Classics, where I’ll be doing full reviews of films that are remakes of classic-era releases and discussing how they differ from their predecessors. We kick off the series with a review of the live-action Cinderella, released earlier this year. A wicked stepmother, a fairy godmother, and talking mice… Cinderella is such a classic that these characters are as instantly recognizable as the title character herself. Disney’s cartoon version of the long-told story of Ella, a girl made servant by her stepmother after her father’s death, was released in 1950. 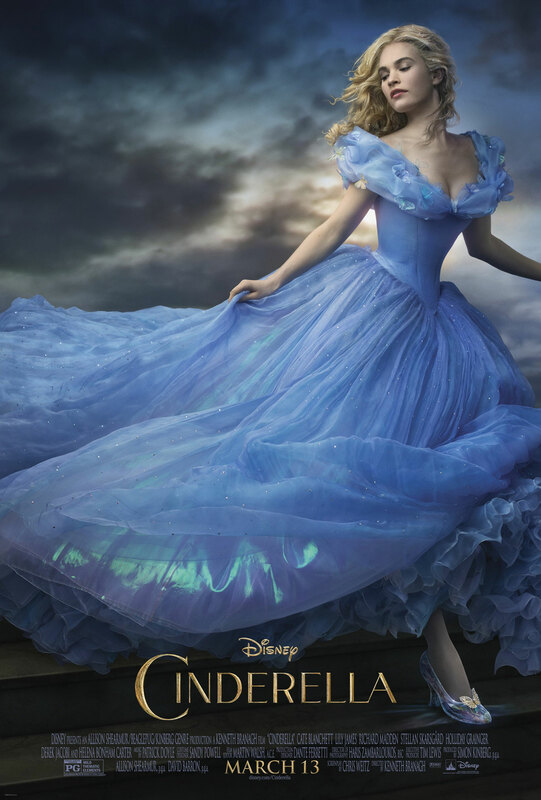 Continuing their recent string of fairytale updates, Disney released a live-action version of Cinderella on March 13, 2015. Based on the trailer, I had pretty high expectations for the 2015 Cinderella. At the very least I knew it would be visually stunning, and it is — even more so than the trailer lets on! The colors are vivid and varied, and the costumes and set design are to die for. If I were to revive the old “Characters with Enviable Wardrobes” list I did years ago on this blog, it would be mandatory to include a few characters from this film! 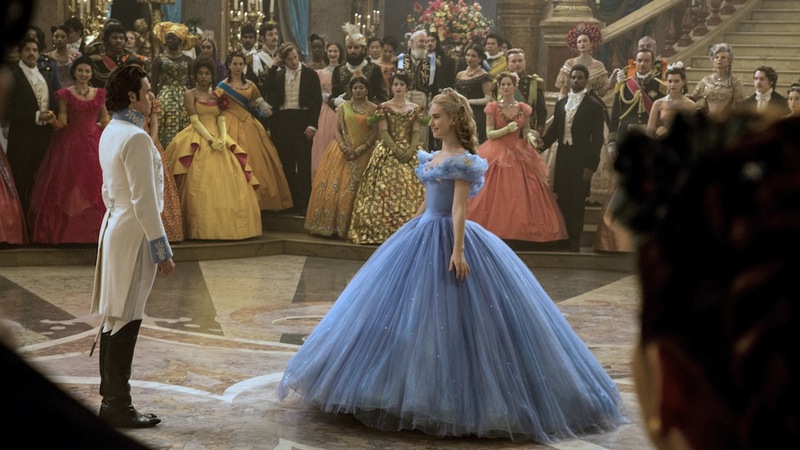 2015’s Cinderella is very much a feast for the eyes. Beyond its beauty, the film is also a very nice re-telling of the classic tale. Preserving much of the magic and sweetness of the original, the story is also made fresh by putting the focus on Ella’s strength rather than just her love story. There are still the slightly-cheesy, romantic scenes thrown in to make the audience say “Aww,” but Ella is given more of a personality and is not as reliant on the prince to “save” her from her situation. There’s also an addition to the story that works very well: Ella and the prince (named “Kit” in this version) meet prior to the ball. He’s on a hunt, and they meet in the woods. She has no clue that he’s a prince; he tells her that he’s simply an apprentice at the palace. Giving them a meet-cute prior to the ball gives them a bit of a deeper connection, whereas the 1950 film takes a “love at first sight” angle, in which they meet at the ball and fall in love right away. In this newly-released film, we get a sense of just how horribly Ella is treated by her stepmother and stepsisters. They make her do all of the housework herself, degrade her at every opportunity, and speak ill of her deceased mother right in front of her, knowing how much it will hurt her. Though she does lose hope for a moment, Ella in general tackles her struggles with grace, and the viewer gets the sense that even if she lived in a kingdom with no prince, she’d find a way to make it through. “Have courage and be kind” is her motto, passed to her by her mother, and she truly lives that motto. She stands up for herself, even reclaiming the derogatory nickname given to her by her stepsisters, introducing herself as “Cinderella” to the prince. This gives a strong moral angle to the film. Even when the audience is wishing Ella would toss some witty insult at her stepmother (or better yet, shank her with the broken glass slipper! ), she holds tight to that motto of courage and kindness, forgiving her step-family despite all of the ill they’ve brought to her life. This film seems geared toward adults who grew up watching the 1950 version, which probably contributed to my enjoyment of it. There are a few over-the-top moments of slapstick thrown in for the kids (the pumpkin scene, for example), but they are less frequent than in the 1950 film, which features plenty of silly animal scenes. The latest version of Cinderella is also surprisingly funny! Many laughs come from Ella’s stepmother and step sisters, who deliver some of the film’s wittiest dialogue. Though they’re despicable people, they sure are fun to watch. All of the performances in the film are great. Cate Blanchett steals the show in her perfectly-cast role of the stepmother. Lily James, best known for her role in Downton Abbey, is quite captivating as Ella and brings the required mix of strength and vulnerability to her performance. Having grown up on classic Disney cartoons, 1950’s Cinderella is a film I’ve always enjoyed at least for its nostalgic value. Like many fans of classic Disney, I was doubtful that a modern adaptation could be anywhere near as good as those old cartoons. But in a rare instance, Cinderella‘s 2015 remake lives up to (and, in some ways, outshines) the original, putting my doubts to rest with a fresh take on the story, gorgeous visuals, and solid performances.